It is almost a month since any new update in my blog, as I was revisiting the previous posts. As well as I am also learning new recipes from my friends and trying some new from other blogs. 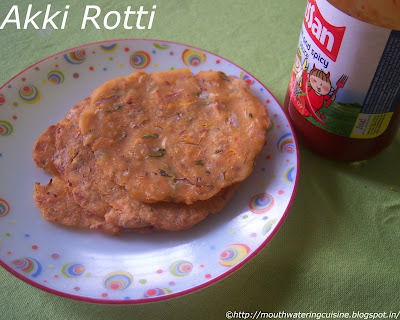 The result of the process is this new post Akki Rotti. Akki rotti is a kind of roti made with rice flour and adding some spices and onions. It is consumed for morning breakfast with any pickle but I preferred it for evening snacks time. 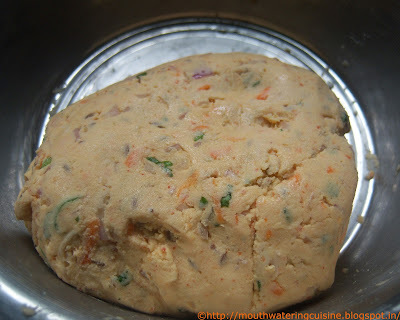 In a mixing bowl add rice flour and all other ingredients. Add chopped onions, green chillies and coriander leaves. Add grated carrot and ginger also. Mix well. While adding little portions of water, make a smooth dough of it. Do not pour all water at once, but add it little portions only. Take a lemon sized ball of the dough, spread it on a greased sheet. Spread it as thin as possible. Heat tawa, put this roti on to it, pour one tsp oil. Once cooked, flip it to other side and cook for another two minutes. In the same way do it with the rest of the dough. Serve hot rice roti with sauce or any pickle.